Today, I’m delighted to feature an interview with florist David Ragg of Lansdowne Florist, together with images of his beautiful floral arrangements. You may remember that I’ve featured David a couple of times, including at the Christmas Preview Event at New Covent Garden Flower Market last November. I’m a third generation florist. My grandmother and mother were both florists, and my parents also had their own floristry business and I worked for them. When I was at college, I was interested in design, but going on to study it didn’t really appeal to me. However, I don’t regret not going to study design at college. 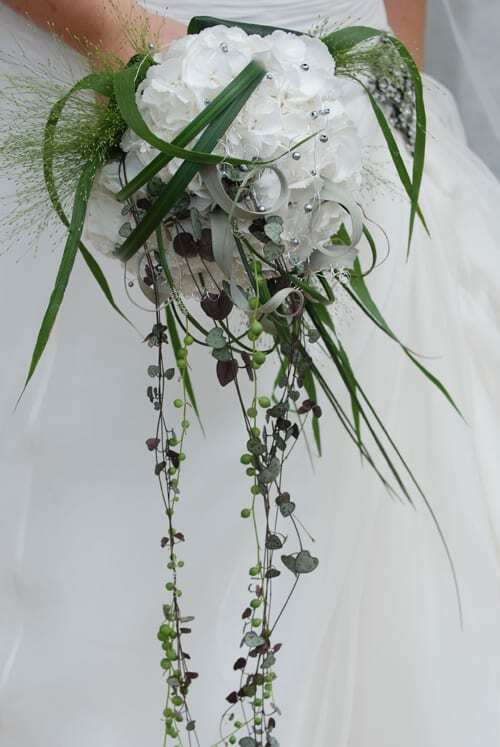 I love what I do and am proud of my achievements in the floristry industry. When did you start your floristry business and where are you based? Over twenty years ago, my parents bought the business in Bournemouth where I’m currently trading. I also have a shop in Wimborne, which I’ve had for four years. At Bournemouth which is the main shop, we’ve recently realigned the space. Originally, it was two shops and half of the space was a card shop. We’ve stripped it out and restyled it as a studio where we can hold workshops for ten to twelve people. We’re primarily aiming our courses at people who have some floristry experience, for example, people who belong to flower clubs. But there are courses for people who’ve never done floristry before. And this year, we’re also holding workshops in the Wimborne shop. I love form and structure. I get inspiration from different places, from magazines to a textile print, to nature. There are classical forms in nature that I’m inspired by. For example, a dandelion seed head or macro shots of flowers. 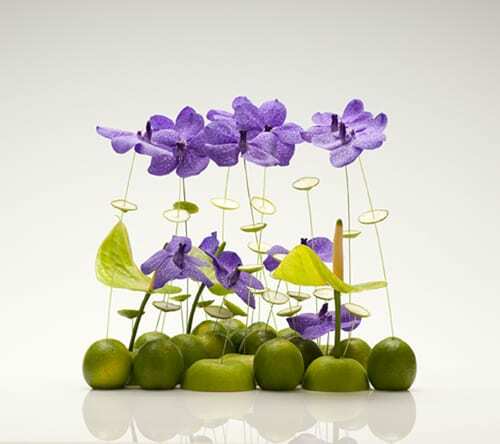 Ultimately, it all comes down to form and structure, particularly the floral art pieces. I just like clean lines and textures. My style is modern British. There isn’t really a British style. There’s a London style, which works for the event industry. The British style is a little confused because it’s taken from lots of different aspects, like Scandinavian and German styles. It varies throughout the year, but overall I love roses. They can be used in so many different ways. They can be traditional or contemporary, and I love all the different varieties and colours. I still get excited about finding a new variety. In the New Year though, I love tulips. Could you tell us more about all the competitions you’ve entered? The highlight for me competition-wise was The Europa Cup in 2003 which was held in Spain. It’s like the Champion’s League of Floristry. It was incredibly stressful and I didn’t do particularly well, but I feel that you learn a lot from your mistakes in competition work. 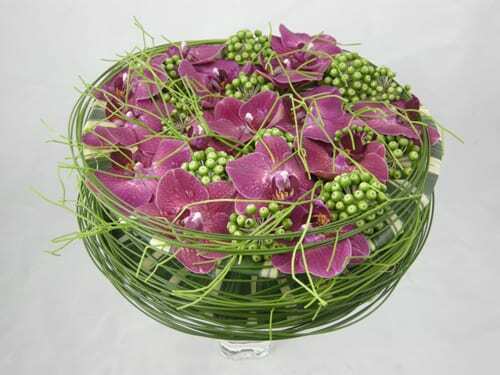 In terms of success, the highlight was Florist of the Year 2000, mainly because I won it. I’ve also won Gold Medals at the RHS Chelsea Flower Show for the last two years with Interflora and 3 other Gold Medals under my own name. How did your book, Monograph, come about? 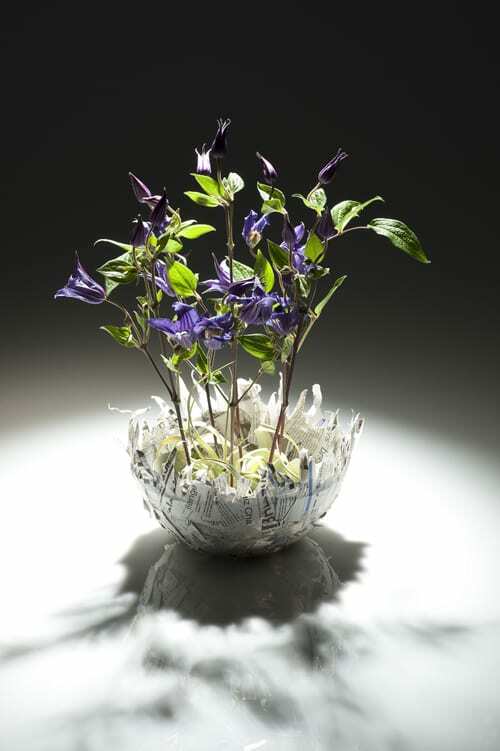 It all came about after submitting some designs for the book, International Annual Floral Art. The publisher then asked me if I’d be interested in my own solo project and that’s how the book came about. 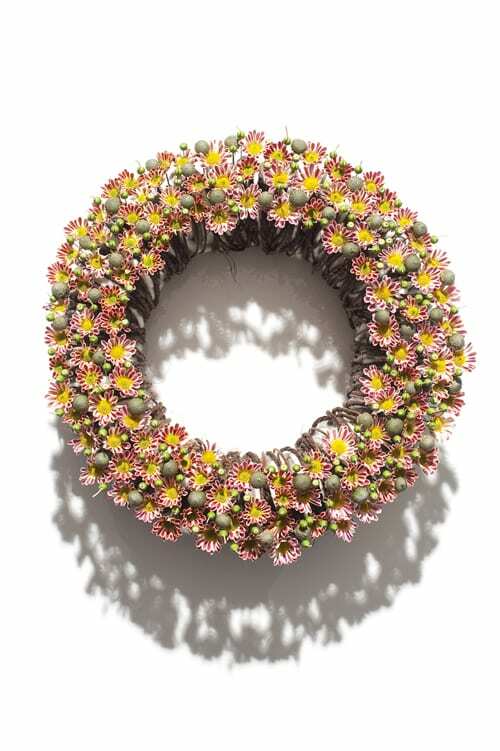 The book is all about floral art, shapes and forms…all with a touch of humour! Perfect as a coffee table book. I’ve been organising the workshops for my Bournemouth and Wimborne shops. 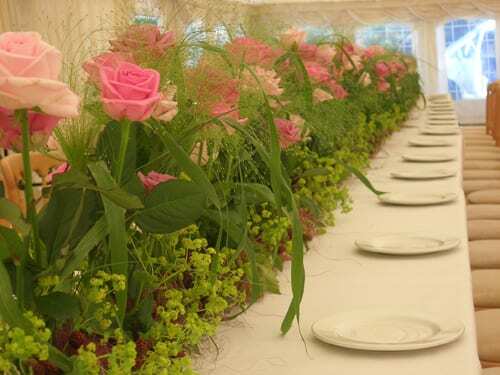 We’ll be running wedding flowers courses, contemporary design workshops and even week long courses for those who want a bit more concentrated tuition. Details are currently being updated on my blog. I’ve also been involved with the Interflora Flower School. 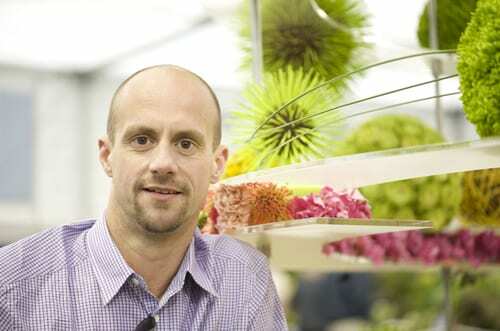 I’ll be creating the Interflora stand at the RHS Chelsea Flower School with my colleague, David Denyer. 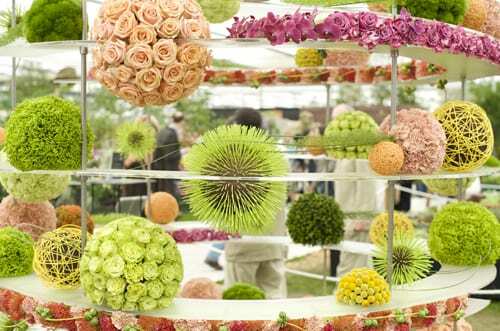 David & I will also be attending the AIFD (American Institute of Floral Designers) National Symposium in Miami in July. We’re presenting a design show called ‘Some Like it Hot’ – should be really good fun! Be like a sponge and absorb everything. Get to as many events as you can afford…workshops, demonstrations and trade shows. Look through books and on-line. Keep an open mind. It’s very important to establish your own style. Take influences but not copy. There are enough people doing workshops. 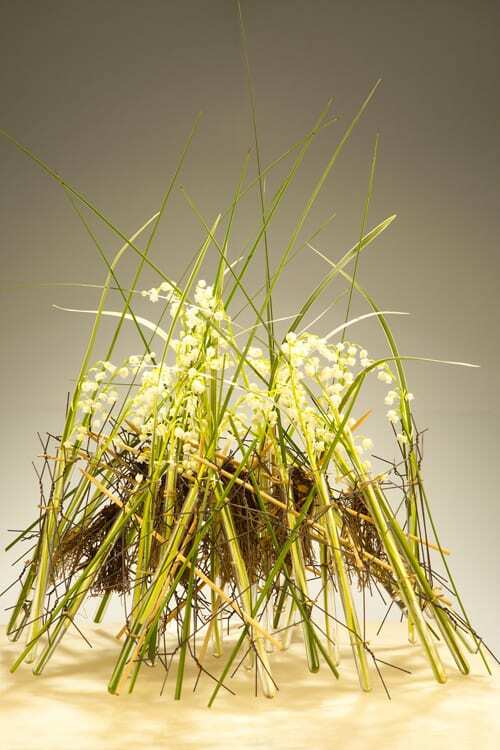 Wherever you are in the country, there will be somewhere locally you can learn about floristry. If you’d like to keep up-to-date with David’s news, he has a blog and is on Twitter and Facebook.